When in auto mode, it will automatically switch between heating and cooling as necessary based on the temp in the house. 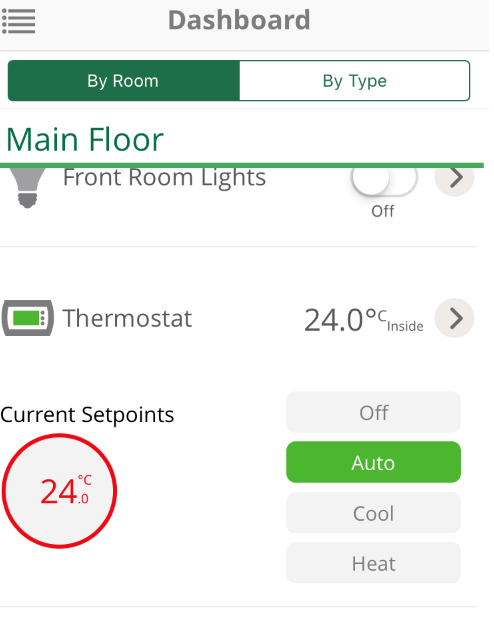 When in auto mode, the vera app or web app do not show the currently displayed set temperature, nor does it change the thermostat when its adjusted from the app. There are no problems when using the thermostat in Heating or Cooling mode. I suspect this is because the thermostat has 2 set points. As seen below it will heat when below 22.5, and cool when its above 25.5. Is there a work around or update for this? The below pictures were taken at the same time. I do not have or use that particular thermostat but what I have done is use PLEG to control the thermostat. 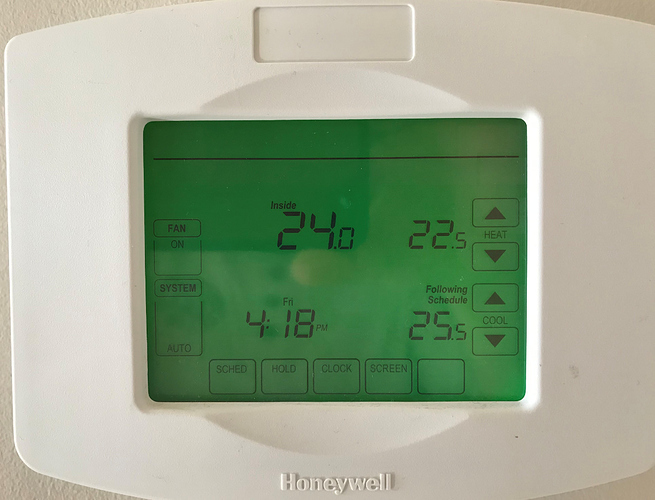 It looks at outside temperature (O) to decide if the thermostat is in heating or cooling mode. If O>65F, set to Cooling. If O<60F, set to heating. This is very handy in the spring and fall when we tend to heat in the morning and cool in the afternoon. Using iPhone locator, PLEG sets the house mode, except Night Mode. Night Mode is on a schedule that is ignored if in Vacation Mode. I have a work week and weekend schedule. By definition in PLEG, if both phones are > 100 miles away, PLEG sets Vera to Vacation Mode. If either is less than 75 miles away, it switches to Away Mode.